We have lots of sidewalk chalk hanging around the house and while my kids enjoy drawing and playing with it they really don't use it all that much. 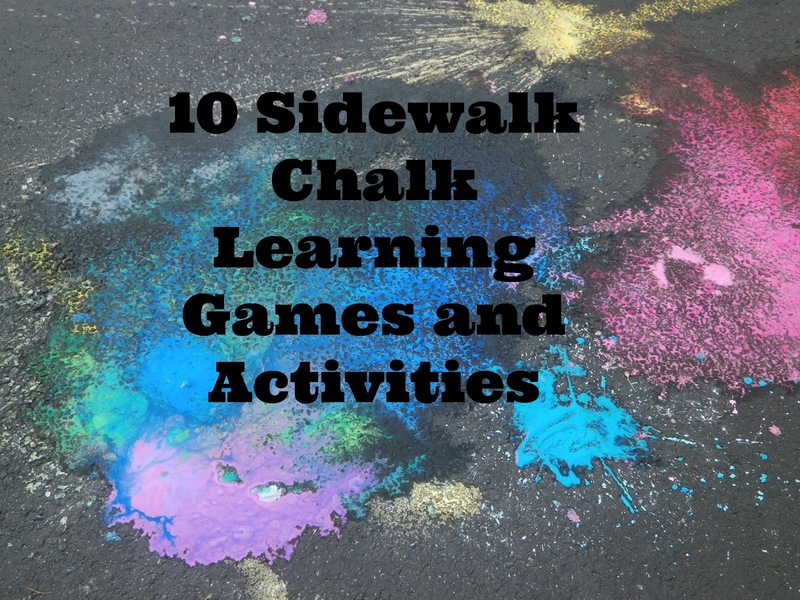 I have found a few fun ways to use sidewalk chalk in our schooling and have several ideas for more fun learning games that I'm hoping to try over the next month. Most of the games we use are for math and reading/ language arts since those are the two subjects we focus on the most. But most of the games can be adopted to any learning stage-- think bomb the color, shape jumping, vocabulary hopscotch, shoot the capital (have all 50 state capitals written out and when you call out the state they blast the capital with a water gun). I just came up with that idea as I was typing this up and now we HAVE to try that! 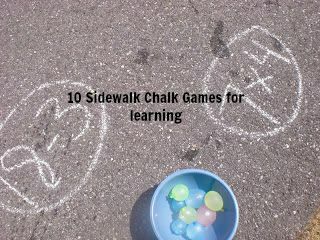 Once you start thinking creatively I'm sure you can come up with some great fun ways to teach using sidewalk chalk too. 1. Sight Word hopscotch: Drawing a traditional hopscotch board on our driveway, I filled in all the boxes with sight words and had them read the sight words to me as they landed on each box. A simple, fun way to practice sight words. 2. Jump on the letter: When Evan was in preschool and just starting to use his letters I used to write a variety of them around the driveway. I'd call out a letter and he'd run over to it, call it out again, and them jump on it. I modified this activity to include my older boys by having them run around jumping on letters in order to spell out spelling words. 3. Shoot the sight word: I wrote a variety of sight words in different colors around the driveway and gave my son a bucket filled with water and a water gun/shooter. He walked around reading the sights words and then blasted them off the pavement using the water. 4. What makes the sound? : With Evan still learning how to read this is a game I'd like to re-visit. I would write letters or pairs of letters (think th- wh- sh-, etc.) and call out a sound. He'd have to tell me which consonant blend made that sound by running to it, jumping on it, landing a Lego spaceship on it, etc. 5. Target Practice: We've drawn targets on the ground with sidewalk chalk, thrown wet sponges at them and added up our scores for some fun summer math reviews. 6. Number Line: Draw a number line on the driveway and have them practice addition and subtraction moving up and down the number line. Or if you're real ambitious draw out a hundreds chart and practice counting by 2, 5, 10, adding, subtracting, etc. 7. Exploding sidewalk chalk baggies: while this does not technically use sidewalk chalk it comes out looking just like sidewalk chalk and it's a lot of fun! We used a mixture of vinegar, corn starch and liquid watercolors to make a paste in a baggie. We tried to fill them up a good 1/3 of the way and left them on the watery side. We made a variety of colors and then brought out some napkin/ baking soda packets with us. As we were ready to set each bag off we put a baking soda packet into each bag, made sure it was sealed tight, and then shook it up. We watched the bags swell until they popped leaving colorful explosions in their wake. 8. Boggle: For some spelling fun draw a large chart of numbers and using the rules of Boggle see who can spell the most words walking (or jumping) from letter to letter. 9. Counting by 2's, 5's 10's, etc. : I've written numbers across our driveway with skip counting and have had the boys jump from one to the other or call them out as they're riding their bikes around. It's great practice for skip counting and they can "cheat" by looking at the ground as they go around and around. This would work great for multiplication facts; put the answers to just the 8 times tables and have them say them in order over and over and over again. It's a fun way to get that repetition in! 10. Bomb the Math Fact: I divided our driveway into three sections. Wrote math facts inside small ovals using sidewalk chalk and gave each of the boys a bucket of water balloons. They called out the math fact, told me the answer, and bombed it away using the water balloons. It's such a fun and low key way of practicing. I know that's how my youngest learned his letters. We were just playing and drawing side by side; I'd draw a letter at a time and ask him if he knew the name. Once he stopped answering or looking I stopped asking and went back to drawing. Over the course of a few different drawing times he picked up more and more. I always kept it light and playful for him. Whether homeschooling or any type of schooling, this could be practice for kids. Thanks for sharing on Family Joy Blog Link-up. Please come back and join us again! Very cool ideas that I'm sure kids will love! Thanks for sharing with us at the #LMMLinkup! Thanks for stopping by and for hosting! Drowning out the What If's?